Before I get into talking about this beer, I feel I must say this: Garrett Oliver, The Brooklyn Brewery’s Brewmaster, is an incredibly cool guy. He’s enigmatic, stylish, and infectiously-enthusiastic about beer and brewing. His book, Brewmaster's Table: Discovering the Pleasure of Real Beer with Real Food is exceptionally well-written, informative and entertaining, and one of my all-time favourite beer books. He also produces amazing beer. 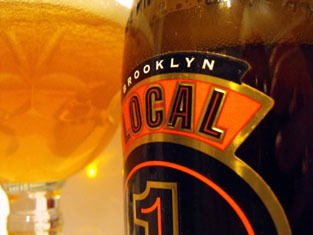 Brooklyn Local 1 is packaged in an elegant champagne-style corked bottle. Popped open and poured into a chalice glass, it’s glimmering golden orange, effervescent, and finished with a thin white head. Musky, pungent fragrances are set against fresh, zesty aromas. Belgian yeast-sourness is complimented by citrusy, orange-rind flavours and a light pepper seasoning (not literally of course – there’s no weird black bits floating in this beer). Though described as a ‘Belgian-inspired Strong Golden Ale’ on the brewery’s website, I would say this beer is firmly in the saison category. Like all the best strong Belgian ales, there’s no alcohol burn despite its 9% ABV; that alcohol content is buried, hidden beneath layers of carefully-crafted flavours. Non-Belgian breweries’ ‘takes’ on Belgian ales often leave me cold – I just end up craving the real thing – but this exceedingly-drinkable beer holds its own against anything I’ve had from Flanders. 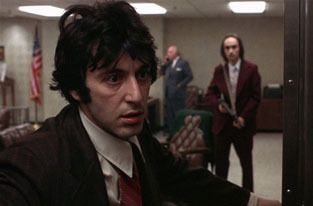 Dog Day Afternoon was directed by the prodigious and prolific Sidney Lumet, and stars Al Pacino and John Cazale. It was released in 1975, a year after The Godfather: Part II came out. It’s based on the true story of John Wojtowicz, who, along with accomplice Sal Naturile, held up a Brooklyn branch of the Chase Manhattan bank in August 1972. Dog Day Afternoon won the Academy Award for Writing – Original Screenplay, and was nominated for five other Oscars and seven Golden Globes. This is the first time I’ve seen it. The beer is poured. The lighting is suitably low. I make myself comfortable and press play. No menus, no trailers, no extras. Straight into the film. The opening few minutes are funny – farcical even. But there’s a bubbling intensity there too. There’s nothing funny about Brooklyn Local 1, but it is a light-hearted, easy-drinking beer that gradually reveals layers of intricate complexity and mysterious depths. Despite genuinely comical moments, this film is by no means a comedy. Pacino is at his intense, focused best, expressing so definitively what it is to be male. The brilliant Cazale is both vulnerable and frenzied, and utterly compelling. It dawns on me that I haven’t seen a piece of cinema that has so emotionally-captivated me like this in some time. The plot takes bizarre, dark turns, but the complex, challenging subject matter is handled with astounding artistry and sensitivity. Maybe it’s the relatively high alcohol content of this beer lubricating my thought processes, but I’m totally convinced at this stage that Dog Day Afternoon is one of the best films I have ever seen. Definitely top 5, possibly top 3. It’s a powerful, poignant masterpiece. The film ends and I feel the way you only can when you’ve just witnessed something life-affirming. Yet maybe I’ve not given enough thought to the power of the match here; would I have enjoyed this film as much if I had watched it without the accompanying brilliant beer? Whether or not that’s the case, it’s no longer important. This unique experience will stay with me. When I drink this beer I will think of Pacino’s captivating performance. If I see Dog Day Afternoon again I will taste Brooklyn Local 1 on my lips. Forever associated, for ever and ever. Though I may never again attain such immaculate synergy, this is the type of pairing I want to experiment with over and over. Forget popcorn – what would be your ultimate movie and beer match? A life enhanced by beer. Beer enhanced by life. Drop me a line at chris@beerandlifematching.com. Or if you're that way inclined, follow me on twitter: @beerpluslife. Follow beer and life matching by email. Subscribe to beer and life matching.